We bought my favorite item last month, disposable diapers. Hopefully this batch will get us though potty training. We also got some acrylic paint and a new water bottle for Chrissy. This was a rough category this month. I bought a bunch of supplies to finally wire up our hot tub. Fortunately, I think I'll be returning some stuff, so we will get some of this money back soon. We bought some new clothes for Frugal Babe, including Anna's dress from Frozen, some hot weather PJs, and a super cute flamingo romper. Chrissy splurged on her biennial haircut last month. That expense could almost go in the charity category because she donates her hair to Pantene Beautiful Lengths. She also bought some various beauty products. Frugal Babe broke her latest pair of glasses, so we ordered an identical pair. 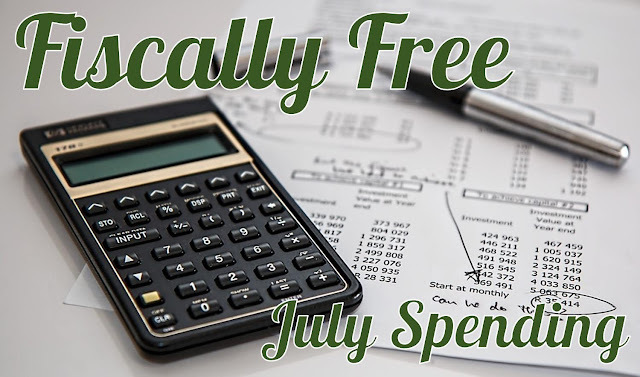 Did you stay under budget in July? Let us know in the comments.